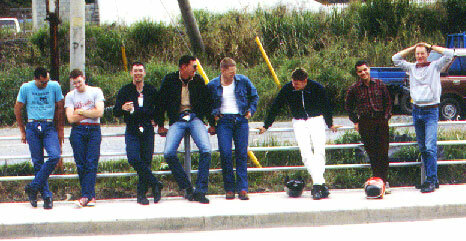 Members of the so-called “Fun Bunch” make a roadside stop on their way to a beach in Northern Okinawa. There was a beach we used to go to when we had a 96-hour liberty. We called it “96 Beach” because it didn’t really have a name. It was just a secluded beach we found. Pictured are Bruce Swain, Pat Hennessee, Brian Hanson, Jim Frink, Bob Plomedahl, Andy Klein, Matt Ciarametaro and Jerry Deex.